Within Monsters & Treasure of Aihrde lies a veritable host of legendary monsters for your Castles & Crusades game. From the epic monsters of times deep to the wandering miscreants of the savage plains, Monsters & Treasure of Aihrde brings to your table wholly new and unique creatures, both good and evil. For the first time the C&C bestiary offers a twisted look into the Wretched Plains and the demons and devils who people them. Creatures of such malign evil and incurable wickedness provide your characters worlds of nightmarish adventure. Each monstrous entry comes fully detailed with descriptions, habits, treasure, combat, special abilities, as well as details on culture where needed. Though created for TLG's default setting, After Winter's Dark: Aihrde, Monsters & Treasure of of Aihrde is fully compatible with other campaign settings. With over 150 monster entries and scores of new specialized magic items, this work promises a host of adventuring glory. This monstrous tome is beautifully illustrated and fully compatible with any home grown setting or inserted into your Aihrde campaign. 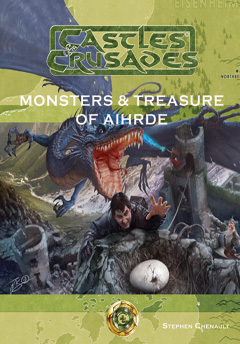 Though the M&T of Aihrde includes the many monsters that have already debuted in The Crusader Journal, Monsters of Aihrde PDFS I-IV, adventure modules, and free downloads, it offers scores of new monsters and mounds of treasure hitherto unseen. Expanded beyond the scope of the original Monsters & Treasure, this subsequent work promises hosts of glory that only you can wrest from the hands of creatures as powerful as the Mogrl, as small as the Bogtilt, or as mysterious as the Moundrule.